DogsBite.org - We can't guarantee how long this will be viewable, so watch it while you can. The ad depicts two "chained up, junkyard" pit bulls that try to attack a man who enters the property to get his cell phone. The only mistake Verizon makes is that under many circumstances, the chain restraining the pit bull snaps, which results in either death or maiming to the victim. Pit bull advocates are enraged over the ad. Well, I’m sure the pit bull advocates are depressed. They are frustrated because the world does see this dog diferently than they do. Perhaps it’s the number of maulings or very close calls so many people have had with this dog. The commercial is scary and all to often true. I was wondering how long it was going to take until pit bull owners protested this ad. Does anyone have a link to what they are saying? I need a good laugh. The ASPCA forgets to add that pit bulls were selectively bred for dogfighting for 2 centuries prior to today’s “bad boy” status. Today’s bad boys simply exacerbate a fully honed genetic bloodline. The ASPCA also tells shelter workers that house pit bulls to install a PANIC BUTTON; that there are cases of experienced handlers who have developed good relationships with pit bulls that ended up still being attacked WITHOUT warning; that pits don’t give the traditional signs of warning before they bite and that pits attack other animals through CHAIN LINK fences! This was an unfair stereotype…Pit bulls are 14 times more likely to break containment and successfully attack…In the real world the chain is likely to snap! If you look up canine weight pulling results, Pit Bulls dominate every sub 100lb weight class! Weight pulling, dog fighting, drug stash protection, lifeflights…any dog my azz! Interesting the common use of the word “loyal” by the pit bull community to describe their dogs. What they are doing by using that word is setting up an excuse for poor behavior. A “loyal” dog to people wanting vicious dogs means a dog that will protect its owner from threats, real or imagined. Therefore a child that enters a pit bull’s yard has a right to be ripped to shreds by the “loyal” dog defending its property and owner. An owner that has a seizure can also be attacked as the “loyal” dog is not really attacking the owner but the disease that is affecting the owner. They have convinced themselves that a dog that displays this type of behavior is not only a good “loyal” dog but these are desirable qualities society should accept in all dogs. I love how the ASPCA describes pit bull owners as unsavory. Too bad they won’t read and comprehend what they write, that people who force society to live with these dogs are indeed unsavory individuals. I think its time for another letter to the ASPCA. The definition of propaganda is information, ideas, or rumors deliberately spread widely to help or harm a person, group, movement, institution, nation, etc. It is infuriating to see the ASPCA participating in the spread of false information regarding this breed. To quote X-Files fictitious FBI agent Fox Mulder, “The truth is out there”, if only people use critical reasoning and common sense when evaluating information distributed by pro-pit groups. The portrayal of pit bulls as common family pets and “heroes” at the turn of the century is complete fiction….it succeeds because it has been essentially hard to disprove. All it took was for pit bull “activists” to scour the internet to find a handful of grainy black and white daguerrotypes of dogs that look vaguely like pit bulls, posing with their masters. Merritt Clifton has used quantifiable data to refute the claim that these dogs were common family pets by searching the classified dogs-for-sale ads between 1900-1950 on NewspaperArchive.com. He discovered that, of the 34 breeds searched, pit bulls ranked 25th. In addition,the claims that pit bulls were “war heroes” stems from the fact that the cartoon image of a pit bull was used on a few WWI military posters. There is also an assertion that the most decorated military dog in history was a pit bull. Actually, “Sgt. Stubby” was a dog “of unknown breed” found as a stray on the Yale campus; many believe he was a Boston Terrier. In what I find as the ultimate irony, the Bad Rap website shows a picture of Sgt. Stubby, next to the full war poster, which depicts a Boston Terrier, a Pit Bull Terrier, and an English Bulldog. Stubby, in a full face closeup, looks exactly like the drawing of the Boston Terrier. 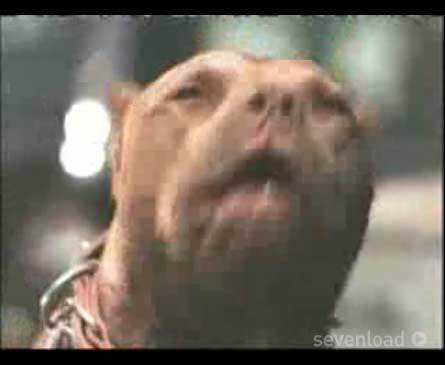 Other fantastical claims regarding pit bulls popularity as family dogs involve pointing out that “Petey” from the Little Rascals was a pit bull terrier. Can I therefore postulate that Bearded Collies were the most popular dog in America during the 1970’s because Tiger on the Brady bunch was a Bearded Collie? Also, pit bull sites everywhere have the audacity to claim that the cartoon shoe mascot, Bustor Brown, owned a pit bull. Outraged Bostonians (like myself) who grew up with “Tige”, know he was a Boston Terrier. Also, he is a cartoon, and his existance in no way indicates that Boston Terriers were the “most popular family dog in America” in the early 1900’s. I hope Dogsbite.org retains this information somewhere on its website….the pit bull propanganda machine has, unfortunately, enlisted the aid of humane organizations in its efforts to resist breeder regulations. Dogfighting is a multibillion dollar industry, and only when victims lobby for the right to remain safe from dog attacks will politicians listen. You can try to post but they remove the comment if you disagree with the pit nutters. I wish the nutters would get this upset everytime a kid is loaded into a life flight helicopter! Currently, there are countless pit bull breeder websites that portray the same image and not a peep from the nutter community. It’s much easier to blame Verizon! To the above poster, you are dead on….I could EASILY find hundreds upon hunders of breeder websites that depict this VERY image. Where is the outrage? Who are they to tell the public that the image is false, when I can drive half an hour to a nearby urban community and see that VERY image? Why are they not trying to stop the breeders and dogfighters that keep the dogs chained in “yards”? Verizon Wireless has stepped into a steaming pile of complaints from animal lovers over commercials for its LG Dare phone, but the marketer is sticking with the 30-second spot. It’s good to see a company with a little backbone.